Connie Chung and Maury Povich are the latest two anchors to walk the cable news version of the plank by getting a new weekend show on MSNBC. The husband-wife combo will be united on-screen for a weekend news show produced by Lizz Winstead, who co-created The Daily Show. Chung, formerly of CBS, NBC and ABC, has been unemployed since CNN shitcanned her show in 2003. Her husband still hosts the syndicated daily talk show Maury. The new program, according to MSNBC flacks, will look at the week's headlines, from politics to pop culture, and will have guests. Sez MSNBC: the two hosts will "cut through the spin and get to the truth, exploring all sides of a story as only two people who have been married for 20 years can do." Why would you allow your logo to be slathered over a faux debate on your "entertainment" (I use the term very loosely) series The West Wing? Don't you guys have... you know... standards? Integrity? Anything? Yahoo and TiVo have announced a deal that will connect Yahoo's online service to TiVo's set-top boxes. TiVo users will be able to use Yahoo's television listings to remotely send instructions to their TiVos to record shows. TiVo users will also eventually be able to view pictures from Yahoo Photos site, as well as local weather and traffic information from Yahoo. Not an option: TiVo users watching their shows via Yahoo. Coming November 22: a Seinfeld DVD gift set that includes seasons five and six. 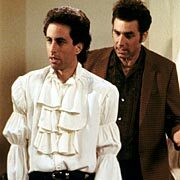 The special edition will include a miniature plastic replica of season five's "puffy shirt."